Hiawatha and Trail of the Coeur d’Alenes. The Silver Valley is a region of the Coeur d'Alene Mountains in Northern Idaho. The "Valley", about 40 miles in length, comprises a number of small mining towns (Kingston, Pinehurst, Smelterville, Kellogg, Osburn, Wallace) along the South Fork of the Coeur d'Alene River and Interstate 90 between Fourth of July Pass to the west and Lookout Pass on the Montana border. This area is rich with history and unlimited options for outdoor activities. Our lodge is within miles of two outstanding ski resorts, that offer activities for all seasons—skiing in the winter; and hiking and biking--(both mountain and road) during the other seasons. Silver Mountain Resort, which offers a 3-mile gondola ride from the base village up to the slopes, is conveniently located right off of Interstate 90; and, Lookout Pass enables you to ski or bike in either Montana or Idaho. Our guests thank us for the extras, like cable television, DVD player, games, a fully equipped kitchen and outdoor grill. The house contains high end furnishings, for your comfort. The property boasts a fire pit (with firewood), for relaxing around on those long summer nights, or after a day of skiing and/or snowmobiling, in a wintery setting. It's the perfect place for hosting church activities, family reunions, quilting retreats and birthday parties. My husband and I have been married for 10 years. We have always enjoyed the outdoors. Two years ago, we made our dream a reality and left the big city of Coeur d’Alene, and moved to Pinehurst. It has been a wonderful adventure--we love it here, and hope you will enjoy it as much as we do! There is parking next to the Lodge or down below. The number for the internet connection to utilize with your SmartPhone is listed on the refrigerator. ICE MAKER NOT IN WORKING ORDER. There are pots ,pans everything you need. Cream and sugar are provide coffee too. Dishes are provided the kitchen is very equipped.toaster,blender crockpot and a lot more. There are a few games for those days of inclement weather, or spending quality time with friends or family. There is a grassy, lawn area on the property where you can set up tents or outdoor games. There are four patio chairs and table on the deck outside of the kitchen. We do a one hole. 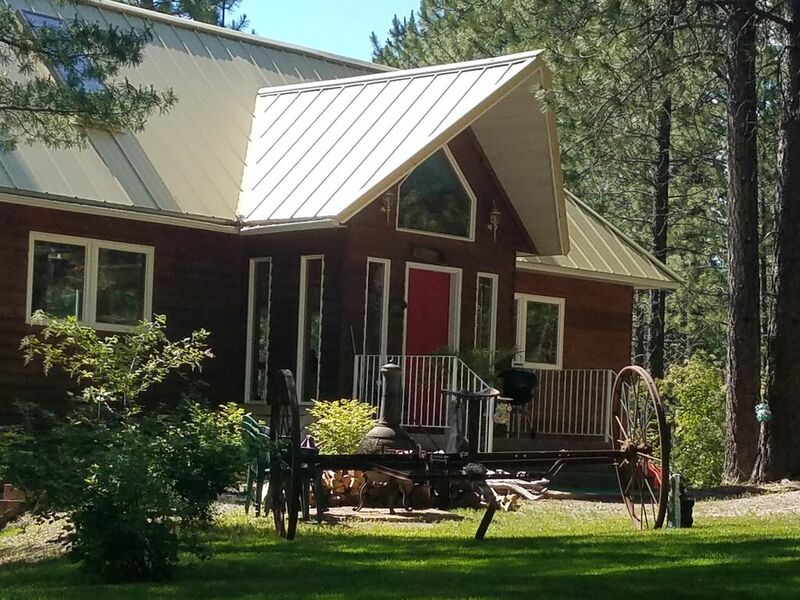 A beautiful two story cabin set in the pines. Our family rented this beautiful cabin for a ski vacation at Silver Mountain. The place was immaculate, yet cozy and well stocked with books, movies, games and more. It was ample size for our family of 4 with two bedrooms. Beds were comfy and we all slept well. Pat and Lisa were wonderful hosts and we enjoyed seeing the deer just outside our window! We loved the lodge and the owners. The lodge is beautifully designed and decorated. We could have spent hours looking at the memorabilia and artistic items in the lodge. Pat and Lisa are welcoming, friendly and warm folks as are the flying squirrel and the deer! It was so nice having coffee and creamer on hand right away for the first morning. We recommend the lodge to anyone who loves the outdoors, the forest and friendly people! Great quite getaway! Central to all sorts of activities. Pat and Lisa are great hosts. House is cozy and just right for a small group. My only concern was the water pressure for showers. It could have been more. Regardless, we will be back again. Our family of 5 spent six nights in this lovely home. It was spacious, clean, had all we needed to cook, relax (indoors and out) and it was located centrally to many of the wonderful amenities of No. Idaho. Pat and Lisa are nearby and ready to assist as needed. We'd stay again. Beautiful property inside and out! The area is beautiful and this property is far enough removed from the highway to feel like you are in the forest without freeway sounds, yet very convenient. I have stayed at several VRBO locations and this is by far the best. The cleanest, most beautiful location, and the owners are great to chat with. They have done some wonderful work creating a little paradise. Next time we are up that way we are definitely staying again. Beautiful well taken care of!! Very very beautiful slice of heaven. Pat and Lisa are phenomenal very nice people. I would highly recommend anyone to come and stay here! It’s only 30 min away from Coeur d’ Alene away from the rat race. , DEPOT DAY CAR SHOW. SQUARE DANCING,JUNE 8TH -10TH. GYROS DAYS JUNE 15TH -19TH. COLONEL WALLACE DAYS JUNE 24TH. STATEHOOD DAY PARADE JULY 3RD, BLUES FESTIVAL JULY 7TH-9TH ACCORDION JUBILEE August 11th-13th .HUCKLEBERRY FEST,& 5k walk/run August 18th -19th UNDER THE FREEWAY FLEA MARKET SEP 1ST-4TH. FALL TIME I WILL POST ACTIVITIES.